Jenny Jen42: Coming up next...Holiday Heap!!!! Boy oh Boy was Bazzart a HUGE success for me! Best holiday show yet for jennyjen history! So I'm sorry I haven't posted but the sweatshop is a mad house! Still haven;t gotten Lucy-fur to use those claws for good instead of horrid clawing....but anyway...if you missed it...I sold out of toaster covers in the first two hours...so I now have more! Working on more pillows and tea cozies too! ANd if you miss holiday heap the next day is MErry mArt!!!! and then..Im done. the shop will be reloaded with special deals.....so herer the details for Holiday HEap here. 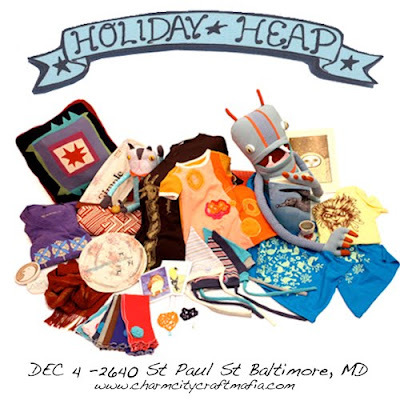 Labels:art, retro,craft charm city craft mafia, craft shows, holiday heap.